"This is a traditional Japanese architectural style," said Suzuki. 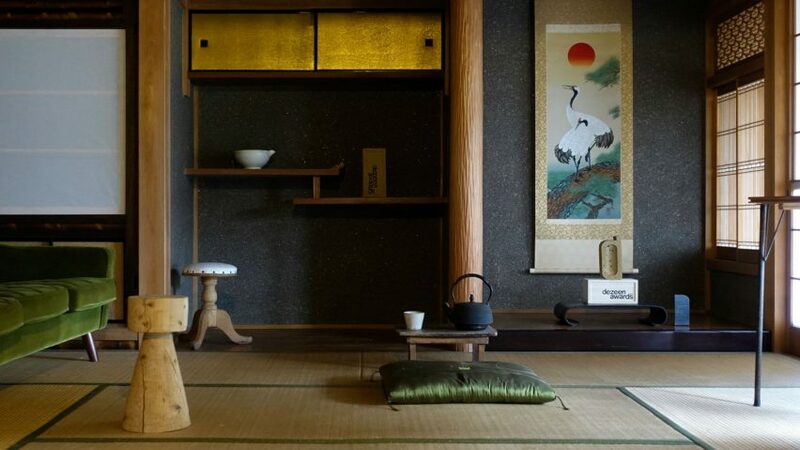 "A tokonoma, or a raised alcove about the size of one tatami mat, is found at the back of a Japanese-style living room that has tatami flooring." "On display amongst our prized curios"
"Our trophy is on display amongst our prized curios, which include interesting materials, prototypes, models, and awards," said John Wardle. "It is up there because we are thrilled to have been selected as winners of house interior of the year." "We are also big fans of the physical design," he added. "Brick is something we are big fans of. Few awards trophies are worth displaying, but this one is quite special." "The trophy gets many favourable comments from visitors to the office. The outcomes are to be felt long-term, with the Dezeen Award notable among our architectural and interior honours. Winning in the inaugural awards season also has its cache!" "Serves as a great motivator"
Petit Pli, which won wearable design of the year, displays its trophy at its London studio, but founder Ryan Mario Yasin keeps the presentation box at home. "We love that the Dezeen Award trophy has two parts," said Yasin. "We keep the trophy in our London Fields studio, where it sits front and centre on our awards shelf and serves as a great reminder of all that the Petit Pli team has achieved since 2017." He added: "It serves as a great motivator whenever we face challenges." The wooden presentation box "lives with me at home," Yasin said. "Seeing it before I start the day and end the night after work is fulfilling and helps sustain my drive and momentum." "To win a Dezeen Award is just great"
"Although our awards wall looks like it's dripping in stuff, that's 20 plus years of effort sitting there," said Roger Mann. "For us to win a Dezeen Award is just great, and to have won two in your first year is brilliant." "We keep the Dezeen Award right in the centre"
"We have a purpose-made awards display made from bamboo and we keep the Dezeen Award right in the centre, at the heart of it," said Markus Roselieb. "The display is in our main entrance room where all visitors pass." "I had my heroes sign my trophy box"
"When I was there at the ceremony, it was really exciting for me," said Roosegaarde, who won design project of the year and lighting design of the year. "All my heroes were in the same room," he said. "People like Thomas Heatherwick and Tom Dixon and and it was really like, wow! It was really fun to know that they are also very approachable and enjoyed the work. I had them all sign the trophy box!" "It has pride of place in our office bathroom"
"Reusability is at the core of what we do, so we couldn't let our Dezeen trophy be any different," said Alec Mills of Dame. "It has pride of place in our office bathroom performing a very different, though no less important, function than it was originally intended for."